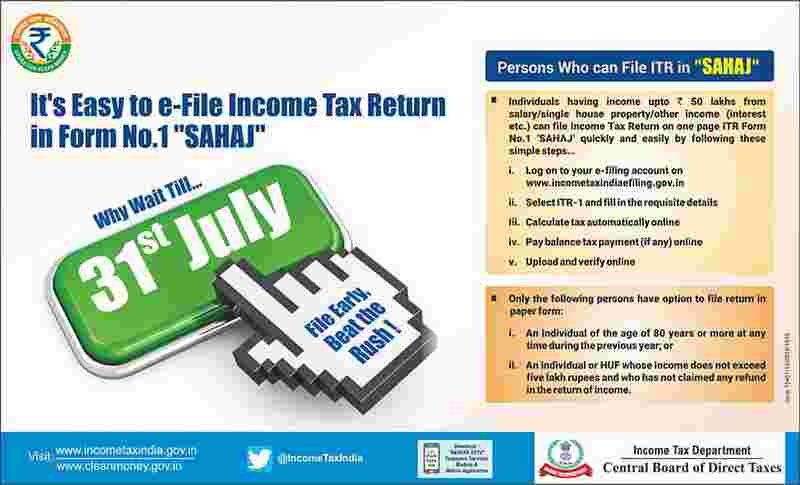 The Income Tax Department (IT department) has rolled out a new advertisement where it directs Indian citizens on who should file for Income Tax Return (ITR) under Sahaj. In order to make tax compliances flexible and easier, the department had introduced ITR-1, also known as or Sahaj Form which is levied on a list of taxpayers for filing their ITR. Recently, the department has also revamped the ITR form 1 for assessment year 2018-19 and has opened the window for filing of this form at their website. In the new advertisement IT department has list out persons who can file ITR in Sahaj and who cannot. Earlier ITR-1 form was applicable for both residents, residents not ordinarily resident (RNOR) and also non-residents. Now, this form is made available only for resident individuals. Earlier, an individual had to show his salary break-up in Form 16, which has been changed and brought under the ambit of ITR-1 form. Apart from this, the revised ITR-1 form also has requirement to furnish a break up of Income under House Property which was earlier mentioned in ITR -2 and other forms. IndIviduals having income from sources like more than one House Property, Lottery, Racehorses, Legal Gambling etc., taxable capital gains (Short term and Long term), agricultural income exceeding Rs 5,000, Business and Profession. Also, if an Individual who is a resident and has assets (including financial interest in any entity) outside India or signing authority in any account located outside India cannot file ITR through it.